Roasted Chickpeas are a nutritious addition to your lunch and dinner or eat them as a healthy snack as opposed to crisps. 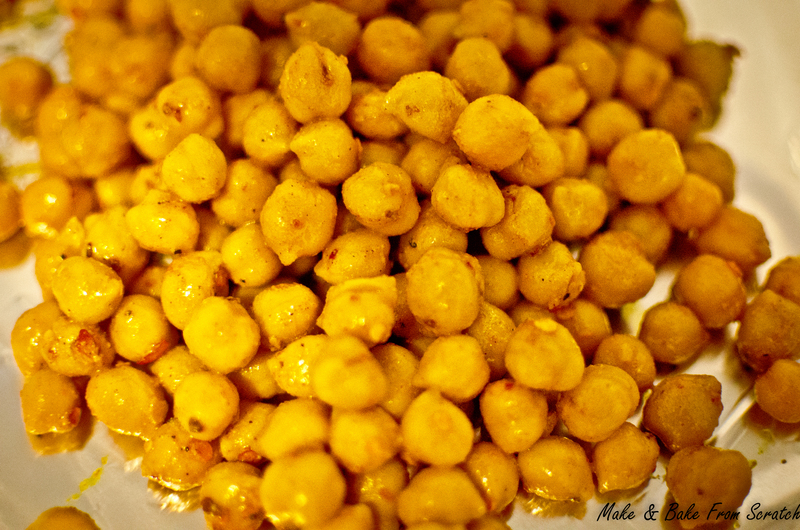 Chickpeas are very versatile. You can add them to salads, quinoa, amaranth, chilli beef and soups. They will inject great flavours into your dish. I usually throw in a dash of cayenne, turmeric, all spice, garlic, chilli flakes, salt and pepper but you can adjust to suit your taste buds. The recipe below is a basic recipe to work with so feel free to adjust measurements. Chickpeas are good source of lean protein, 1/2 cup contains 7 grams of proteins, they also contain folic acid, manganese, copper and bioflavonoids. Drain and rinse, pop in a large mixing bowl drizzle 1-2 tablespoon of olive oil, sprinkle spices , salt and pepper; stir making sure the chickpeas are evenly coated. Spread out on a lined flat baking tray, and roast at 180 for 25-30 minutes ( I like to roast the chickpeas until they are crispy, so leave them for 40-45 minutes).